Verbena rigida is a great addition to the casual perennial border and the Butterfly Garden. Sandpaper Verbena has all of the tools to reproduce between active runners and seeds. I have not had Verbena rigida leap driveways or even sidewalks with runners, though seedlings have taken hold occasionally. I have started carefully planned perennial borders with Verbena rigida included, in the end the Verbena rigida did the planning and went where it wanted. The seasonal aspect makes this work ok though. 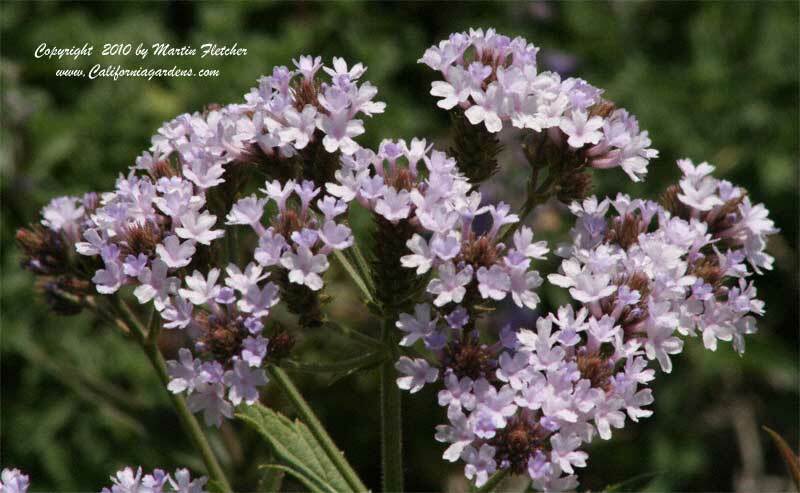 I cut Verbena rigida to the ground in November or December when the plants start looking pretty rough. Sandpaper Verbena likes full sun and can perform well in a hot reflective bed but can also take a moderate amount of shade and keep blooming. The Sandpaper Verbena comes back a few inches to a foot away and starts blooming from Spring through Fall. Verbena rigida is native to Argentina and Brazil. Verbena rigida is root hardy to the low single digits. The Giant Swallowtail, Gray Hairstreak, Mournful Duskywing, and Variable Checkerspot will come by for nectar if they are around. Pale lavender flowers of - Verbena rigida - Sandpaper Verbena. High resolution photos are part of our garden image collection.